A recent post showed you two less-than-pristine pink evening primrose flowers, Oenothera speciosa, and then compensated with one fresh specimen. Now here are two flourishing groups from April 10th along TX 20 east of Red Rock in Bastrop County. The colony above was mixed with some Indian paintbrushes, Castilleja indivisa. 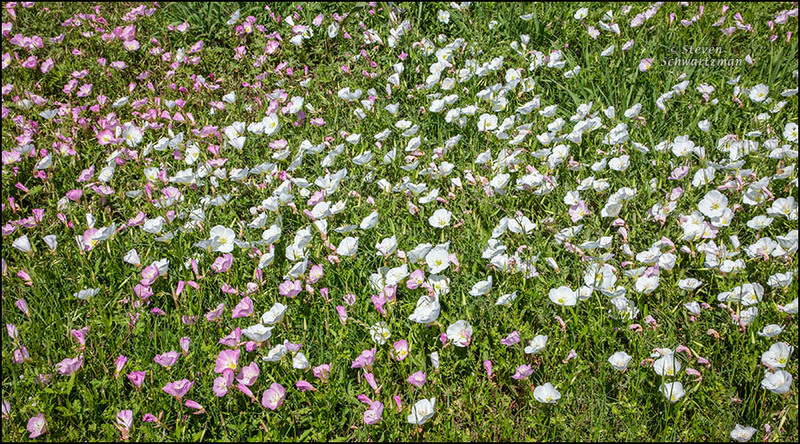 In the group below, the majority of the pink evening primrose flowers were natural white variants. 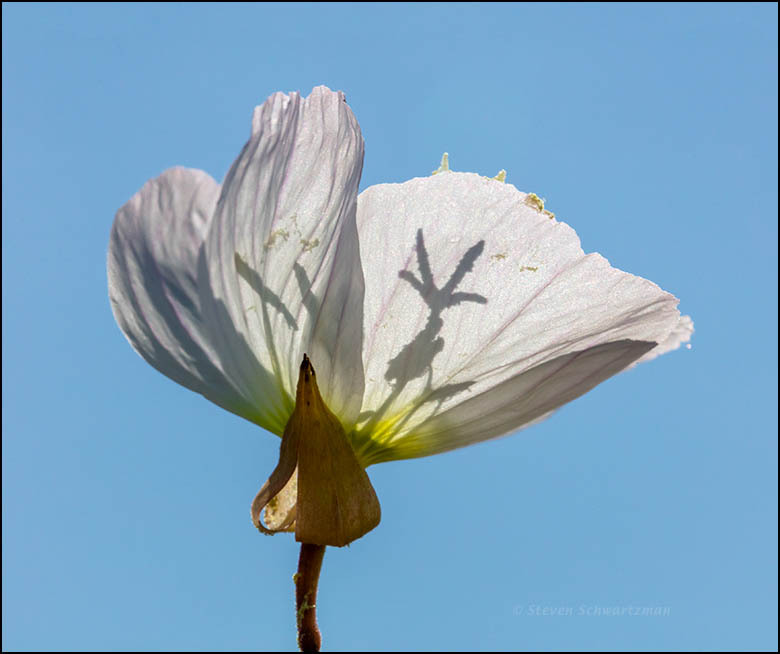 Two days earlier, at the site in Round Rock documented in the other post, I’d already found a few isolated white pink evening primroses, including the one below that I photographed with the sun beyond it to create shadows of the flower’s interior parts. Nice to see those great swaths of color you are so fortunate to have there. At first the season disappointed me. Then it got better—or else I found better places. The watchword for an Austin nature photographer this spring was “Go east, young man.” At least one older man took the advice too, finding good colonies on that side of the divide. 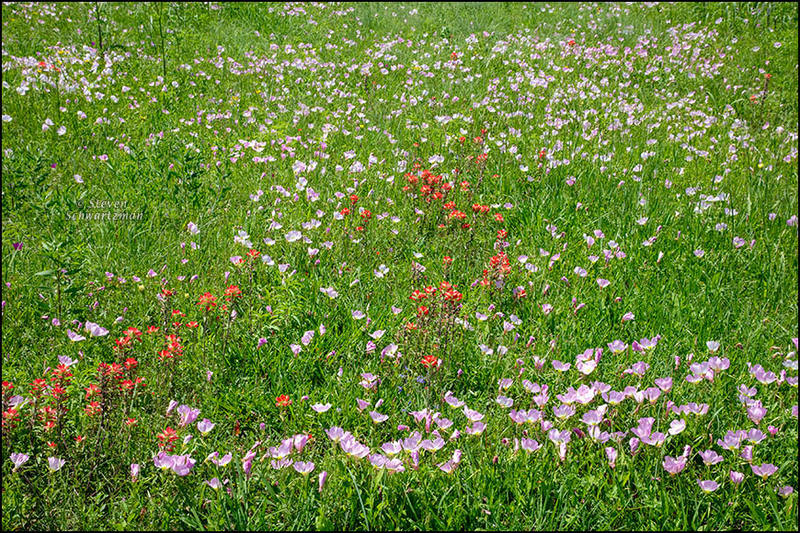 I have really enjoyed your Texas wildflowers, as I haven’t been able to get out this year. I’m sorry you haven’t been able to get out this year. Fortunately the Internet lets us visit many places we can’t physically travel to. That last picture is absolutely stunning in its composition and technique. And a fantastic eye of the photographer [congrats to you] to just spot this opportunity. Thanks for your appreciation. After so many years of doing nature pictures, I’m always on the lookout for different ways of seeing familiar sights, especially abstract ways. The third photograph was a late addition to this post, so your reaction to it make me glad I included it. Glad you did include it. Btw, my wife always has the better eye than I have for good pictures. No doubt you’re better at some other things. That makes for good complementarity. I don’t know how you managed to shoot it, but I’m glad you did. Of the three, it’s the most memorable to me. It’s intriguing. It’s the most abstract and the least commonly viewed of the three, as people would most likely have to sit on the ground or even lie down to get low enough to be able to look up at that angle. I always carry a mat with me because I do so much lying on the ground to get good angles. Thank you so much for these. I left Texas a couple of weeks ago and am now back in NZ … where it’s getting cooler by the day. Still, there are lots of flowers around. But oh, I do miss the Texas spring flowers! Ah, I didn’t know you’d visited Texas. Earlier this morning I was thinking about how cool it must be getting in New Zealand now. I just checked and found the temperature in your area today is supposed to vary between 49°F and 58°F. Not too bad yet. Yes, the Texas spring flowers must have made for quite a contrast with the declining warmth and sun over there. I was in Austin for 3 weeks and could kick myself for not letting you know as I would have loved to meet you in person. However, my time was so full-on that I didn’t see some folks I already know. Maybe when you come to NZ next?! Meanwhile, I’m seeing the flowers thru your lens … which is almost as good. Beautiful flower and gorgeous display! Agreed. Spring got off to a slow start here but you can see in this post and some other recent ones that parts of central Texas eventually managed to bring forth some good wildflowers. And what you’ve been seeing has come from a floral spring here that’s been just average. Things can get more spectacular. We’re expecting rain later this week, although it may be too late into the season for that to help. Glad to hear you like the shadow shot. Translucence has its uses. I was also enthralled by the play of shadow and light in your last photo. Based on people’s comments, that picture is the eye-grabber of the post. That vantage of a wildflower is much less commonly seen and shown than an overview of a wildflower colony, as in the first two views. If there are serious photographers who don’t enjoy playing with shadow and light, I’ve not met them. Such delicate beauties. They’ll soon be blooming here! I didn’t realize (or had forgotten) there’s that much difference in the bloom time between here and there. Our pink evening primroses are still going, but I don’t know for how much longer. Have fun with yours when they do their thing. We had more white evening primroses this year than I’ve ever seen. They weren’t only intermingled with the pink, but sometimes formed whole colonies, and large ones at that. It was easy to confuse mixed pink and white flowers with all white , since the white were turning pink as they aged, like rain lilies. I do think they’re among the hardest flowers to photograph. It’s not always so easy to find a nice, isolated bloom. It’s a little odd, given how many flowers there are, but that was part of my problem. I have dozens of photos of various sized groups of white flowers, but none satisfies me. The one you captured is lovely: not only for the shadow, but also for those pink veins. I think my favorites this year were the ones with distinct veins. There’s so much variety in such a simple plant. Your report about so many white pink evening primroses makes me wonder if this will have been a good year for white ones over a much broader area, perhaps even the entire range of the species. It’s not valid to extrapolate from the experiences of just two people, but I can’t help speculating. The variety you mentioned is one thing that keeps nature photographers going year after year. Even a familiar wildflower can bring surprises, both intrinsically and as a result of what’s on it and behind it. Oh, you just had to throw the white in there! I never see the white ones in the wild, but I have not looked for them either. Ours is Oenothera californica. The flowers look the same, but the plants are rather shabby. Yes, I did have to throw in the pink evening primroses’ white variants, which have put in a better-than-usual showing this spring. Fortunately there’s nothing shabby about them. I predict that loving the last won’t last. Eventually the first will be your first choice.